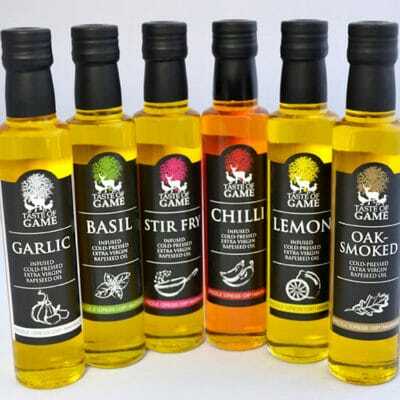 Taste of Game infused cold-pressed extra virgin oils. Adds a tangy flavour to a salad and brightens up dressings and marinades. Also prefect for the more delicate game meats such as partridge, rabbit and pheasant. Perfect to use in marinades when preparing wild boar, pigeon, venison and wild fowl as well as for adding to the preparation of vegetable-based dishes such as potatoes and mushrooms. Ideal for making an aromatic dressing that pairs perfectly with pasta dishes or as a finishing oil to a warm salad when adding pheasant, partridge, rabbit, venison or wild boar. Perfect for spicing up dressings and marinades or for dipping breads. Ideal for finishing for stirfries and curries when using pigeon, grouse, venison and wildfowl. Adds an aromatic smokey flavour to dressings, marinades and is perfect with game meats such as wildfowl, vension, grouse and pigeon. A clean blend of classic oriental spices. The taste is reminiscent of capsicum, lemon grass, coriander, ginger and star anise combined with the nutty flavour of rapeseed oil. Perfect complement to pigeon and venison.